When I was a very young child, I was sharply and steadfastly geared in one direction when it came to games of entertainment, and the direction was decidedly non-athletic. Not that I disliked the feeling of playing sports, exactly — though a bout of yet-undiagnosed anemia left me dizzy and feeling like my head would split open after a hard run or a tennis lesson — but I certainly disliked all the people my age who were keen on that sort of thing. It wasn’t even a matter of personal animus, in most cases, or some resentment over bullying or ostracization. I just didn’t much like most of them, and by extension I didn’t much enjoy the times when I was out running about. And moreover, I had nothing but antipathy for spectator sports, a dilemma in my household as a then-only child, suffering through seemingly endless Giants games, which I found irritating, and 49ers games, which I positively hated (meaning, sadly, that I missed out on any enjoyment of the Joe Montana era). This began to change as I got older, however, as I came better to appreciate and love baseball for everything it is, and form a grudging acknowledgment of football’s entertainment potential, despite what persists as a deeply morally dubious nature of viewership. Basketball’s pretty fun too. Go Warriors. But back in those nascent years of my life, you really couldn’t get me to sit in front of a television to watch sports, without me clawing feverishly at the restraints. The same was true of sports video games, with a rare stipulation — if you weirded it up just enough, I might be willing to overlook it. 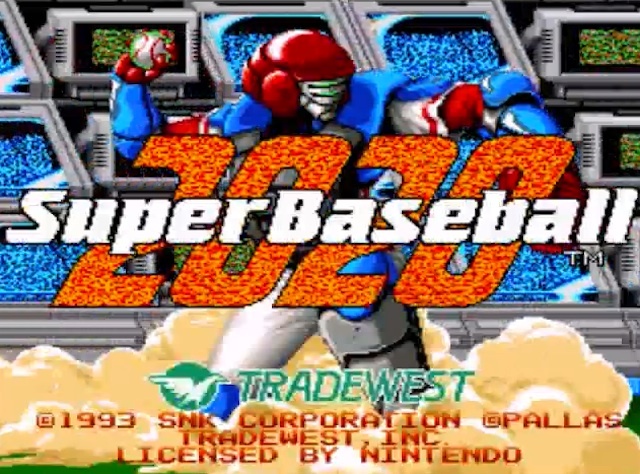 As such, Super Baseball 2020 was right up my alley. I played it, to my admittedly fleeting memory, pretty heavily for at least a couple of months. The conceit is pretty obvious. It’s the distant, terrifyingly futuristic year 2020, and baseball has, through those intervening years, morphed into something similar, but altogether distinct and distant from what it once was. Essentially, it’s the slippery-slope nightmare of every maudlin, aw-shucks baseball writer that’s even lived, with the once-traditional purity of the game swapped out for something more bizarre and inhuman. Literally inhuman, in fact. For you see, over the next mere seven years, the national pastime has a lot of changes due. First, baseball must break down the barrier prohibiting, tacitly if not statutorily, the presence of women on the field of play. Indeed, in Super Baseball, female players are prevalent. One team is comprised entirely of women, with the exception of a lone all-power/no-contact pinch-hitting boor named Wolf. There’s still a troublesome sexualization aspect in all of it, as while the male players are clad in cover-all power armor, the women have just the helmets, gauntlets and boots, but suffice with bustiers and shorts around the middle. By no means does the barrier-breaking stop their, however. 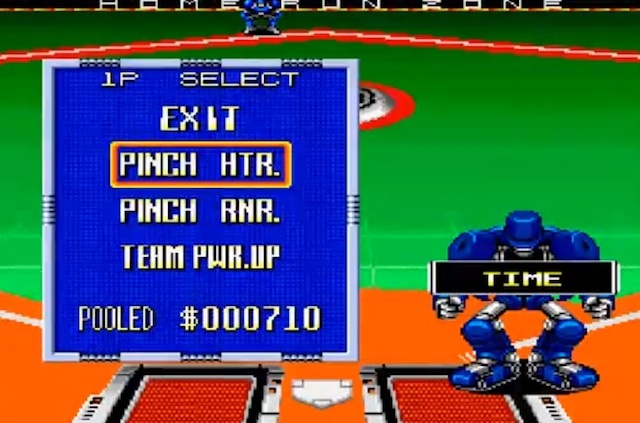 By the year 2020, the world of baseball must not merely accept, but embrace the pervasive presence of robots on the field. Umpires are now exclusively robots, but not the unobtrusive sort you might expect to evolve for the purposes of professional sports. They’re big, blue-plated lugs that are also seemingly in charge of selling you in-game upgrades to your hitting armor. In Super Baseball, wide, wild statistical gaps separate different players, with each most teams boasting at least one implausibly dominant star. The average, or merely slightly above average player, however, can narrow this gap by purchasing upgrades to whichever armor is pertinent — pitching or hitting. The price has to be paid out of the pool of money your team has accrued, earned by turning in great (or pretty pedestrian, truth be told) plays on either side of the ball. The changes to the field are varied. 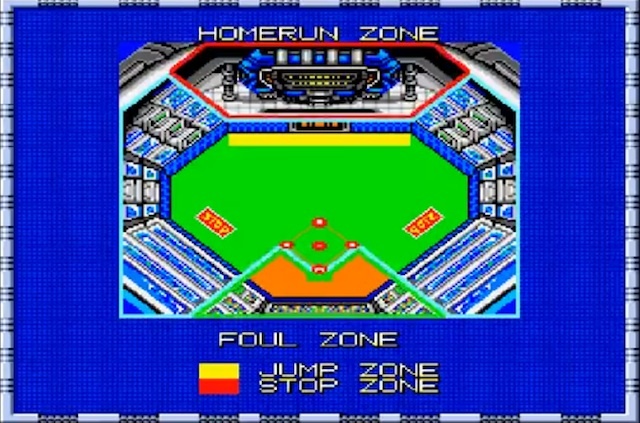 The most shocking element of baseball’s grisly neon future is clearly the Home Run Zone, a carved out space from left-centerfield to right-centerfield, in which you can actually hit a home run, given enough distance to make it over the wall. Any other ball hit over the outfield wall to deep left or right will simply glance and ricochet off the season the other side, eventually bounding back down onto the field to be played. This is true beyond the traditional boundaries of fair or foul territory — a ball hit to the furthest left or right corner of the field, however far foul it would appear to be in a traditional stadium, it’s just another fair ball waiting to be played. That’s because of the Home Run Zone’s less sensational yet more consequential associate, the Foul Ball Zone. That carved-out area on the bottom representes the only place you can actually hit a foul ball. Which, demonstrated above, means that a ball pulled on a line directly to the left or right of the batter, provided it’s hit with enough height to made it past the short boundary of the Foul Zone, is an easy single, if not a potential double. The experience is at once exciting, weird and fun while being hamstrung by cumbersome and clumsy controls. Fielders aren’t in view in any sense until the ball is hit to their vicinity. Most often, they are simply parked under the ball’s trajectory and the work is done for you. In the rare circumstance that you have to take manual control of your defense (most often this is called for when a ball is headed to the Home Run Zone and your only hope to catch it is to use a jetpack boost into the air), it’s extremely stilted and uncomfortable. The small size of the field and relatively slow baserunner speed, since home runs are rarer in spite of the short outfield, the offense-friendly ground rules do even out, though the astronomical ERAs of the pitchers in this league are instructive of what kind of baseball is being played. The graphics and sound seem stripped from an arcade game, which makes sense, as it’s original iteration was for Neo-Geo. This brings the same consequence as the music in almost all games with that early-90s arcade charm, its being interminable and noxious at the amount of time you’ll be listening to it. 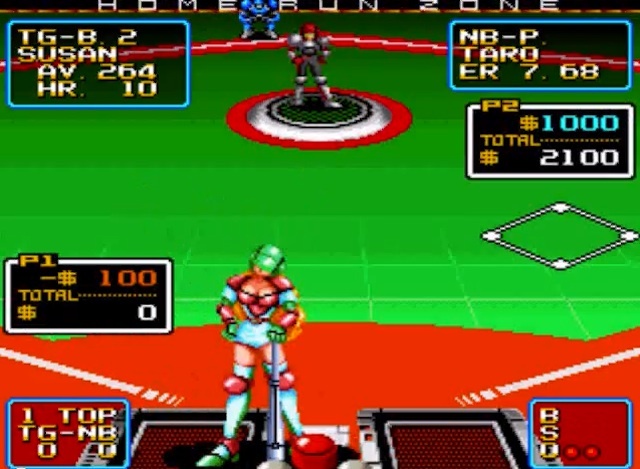 In a lot of ways, Super Baseball feels like a game that could (or something quite like it to a much higher standard) find a bit of success nowadays. As it stands, though, it’s little more than a lightly amusing scrapbook of ideas that could’ve built something more fantastical, or at the very least more playable, than this.